#FridaysForFuture is hashtag for the global “FridaysForFuture” Climate Strike started by Greta Thunberg last year and is aimed at trying to get people and government to act to do something in the face of the impending climate disaster bearing down on us all. It is ironic that when it comes to climate change we are willing to risk of 1 in 2 chance off disaster, but ask anyone to step on a plane with a one in a thousand chance of crashing and you will get absolutely no takers. 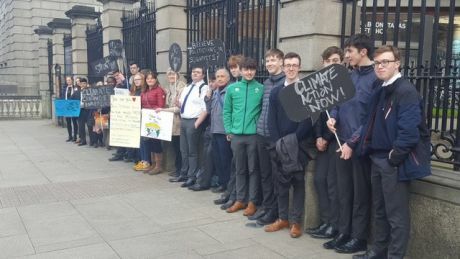 This coming Friday, as every Friday, I will be standing outside Leinster House with my placard as part of the global “FridaysForFuture” Climate Strike started by Greta Thunberg last year. My weekly climate strike started last December quite unexpectedly. For several weeks friends had been sending me links to Greta’s work – saying to me “someone should start that here in Ireland.” My first thought was that “yes, someone should – but they need to be young!” The whole idea of the climate strike is that it is children speaking up for their future. As someone heavily engaged in climate campaigning (http://lornagold.com/2018/11/14/awakening-my-inner-rebel/ ) already I thought I’d leave it to someone else to organise this one. love the posters! Great to see such vibrant young people taking action about global climate strike. So proud of ye! Merkel blames ‘outside influence’ for kids’ climate change protest… but could it just be a protest?